Last night I re-confirmed one of my own beliefs. Neil Gaiman is one of the greatest modern storytellers. For me it started in 1989. I was wandering through a comic book shop and saw the beautiful artwork of Sandman Issue #1. I was instantly hooked. I was a faithful reader and collector of the series through 1996. My collection survived my brother twice; once when he burned my issue 8A (the rare alternative print release), and the destruction by shred of my copy of issue #1 that began it all. I was blessed with the good fortune of a godfather who owned his own comic book shop as a "hobby" - he was a FBI agent by day and comic book n3rd by night. He was my guide growing up to the world of fantasy found in the thin paper pages I loved so much. I owe him a million times over for introducing me to the world of comics and gaming. By 1996, I was starting my life as an adult, but I refused to give up the comics. Lucky for me I married a comic book n3rd and we were able to find a home for our collections throughout our new house. I was sad at the loss of the Endless storyline, but this was about the same time Gaiman's novels began to appear. Neverwhere, Stardust, American Gods, and in 2005 - Anansi Boys - which remains one fo my favorite books of all time. He also started writing children's books. The Graveyard Book, The Day I Swapped My Dad for Two Goldfish, and Coraline just to name a few. The Woves in the Walls, one of my favorite of his childerns series, has a frequent appearance in our evening reading schedule, as do most all of his books. I love sharing my love for his work with my daughter. I can't wait until she is old enough to enjoy his comics and novels. 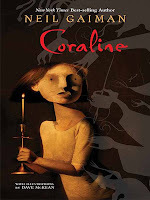 We went to see Coraline last night, and although it wasn't a word for word interpretation of the book, it was beautiful and wonderful, and we all adored it on the big screen. The 3D technology was amazing and impressive. The paper mice sequence at the end (post credits) was breathtaking. I have been a faithful fan of Neil Gaiman for 20 years now. I am thankful for the enjoyment his works have brought me throughout my years, and I hope to continue enjoying his creations for many years to come. That's why I know the name! Sandman!! Duh. I saw Coraline last night. It was AMAZING. I was just blown away by it. Speaking of books, I realized that while I looked at the covers of the naughty, naughty animals books, I failed to look INSIDE them. Doh. I guess I'll just have to come out there again to give 'em a look see.